Wow! It's been a little over a month since we've posted anything! Squire and I are keeping busy with our callings and work and school for me. Here are some pictures of some of the things that have been going on in our lives that last while. I have discovered Mrs.Snigg's Snickerdoodle cookies and we love them! Perfect recipe! Squire and I have been looking for a mirror for our bedroom for quite some time now. When stopping by D.I. we scored and found this one for $15! It's amazing what a mirror does for a room. Our fish Martina had about 20 babies. We saved them, but all but five have died. We're hoping the rest survive. They seem to be doing well. But, we're having fun watching them grow in the meantime. Great update! Love the pictures. :) Glad to hear you guys are doing well. Nice to see some action on this blog! You guys sound busy and happy and productive! You guys do the funnest things! I love looking at your blog and all that your up to...even if you haven't posted for a month, I eagerly anticipate your next post! How are you guys doing? Send me your email and I'll invite you to view my blog! Fun stuff! I feel like before I had Georgie I had all of the organizing, budgeting, cleaning, etc. all under control. Then I had her, got behind, and now I'm slowly but surely getting everything down again. I've recently been interested in doing the coupon thing (I generally feel that things that I need aren't items that really go on sale, but I'm sure I'm wrong), so thanks for the site! 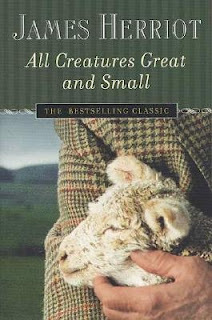 I used to listen to All Creatures Great and Small on tape ALLLL THE TIME when I was a kid! I love those stories!! !